Links on this page open a large image with more detail. In August 1939, war was imminent and Fort Point Grey underwent a rapid modernisation. On 26th August, 15 (Vancouver) Coast Brigade Royal Regiment of Canadian Artillery was called out to man the partially completed defences of the port. 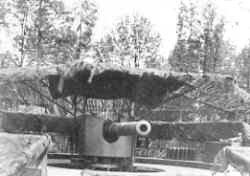 The 58th Heavy Battery of the 15th was to manned two 6 Inch Mk7 Guns which were mounted on temporary emplacements. Work on more permanent fortifications was then started during a period of heavy rain. Three gun emplacements with stores and shelters were constructed. Each gun had an underground magazine which was connected by a tunnel to the others. Accommodation, messing and recreation facilities for the troops were also constructed. Up to 249 men would man the new Fort Grey Battery. The three 6 Inch Mark 7 Coastal Guns installed were mounted on Mark 2 Mountings. They could fire a 100 pound shell to a distance of 14,500 yards at a muzzle velocity of 2,525 feet per second. The 9 man gun crew could achieve a firing rate of 7 rounds per minute. Canopies were constructed above the gun positions and camouflage netting was draped over these. The canopies provided some shelter from the elements for the gun crews and made the gun positions more difficult to spot from the air. 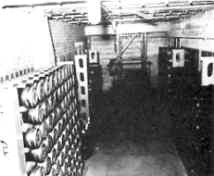 Magazines stored 500 6 Inch shells and their cased propellant charges. The crew working in the Magazine would send ammunition to the gun above by means of a hoist. A hoist can be seen in the centre of the photograph. As well as in the Magazine, ammunition was also stored in ‘Ready to Use’ lockers to the rear of each gun. Each Magazine also had an emergency exit. As well as the main anti-shipping guns, Point Grey required other armament. 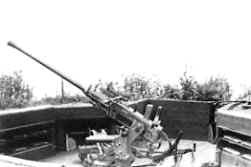 For protection against aircraft, Bofors Guns were installed. First used in 1930, the Bofors were originally a Swedish design dating from 1928. Many were built by the Bofors factory at Karlskroga. They were built under licence in many countries. Many were still in use after 50 years. Calibre 40mm, Muzzle Velocity 2802 Feet per Second (854m), Maximum ceiling 23622 Feet (7200m), Rate of Fire 120 Rounds per Minute, Weight of Shell 1.96lbs (0.89kg). 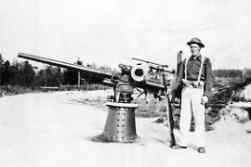 The Examination Gun at Point Grey was a Hotchkiss 6 Pounder. This was used to fire a 6 Pound solid-shot across the bows of ships which had failed to respond to signal lamps. It is recorded that several shots were occasionally required to alert some ship’s masters to the presence of the gun battery. A shot across the bows was to remind them that they needed to respond to signals in order to prevent the Examination Gun’s ‘big brothers’ from joining in. One freighter was actually holed by a solid shot which had been fired across the bows of a fishing vessel which failed to respond to signal lamps. The shot ricocheted off the water and struck the freighter amidships. The Observation Post was the control centre for the coastal guns at Point Grey. From here the guns were given instructions as to the range, bearing and speed of a target. Remotely controlled from the Observation Post, these powerful lights could pick out suspicious vessels and illuminate them for the guns. My thanks to John Eckersley for the following information from “Vancouver Defended”, by Peter N. Moogk at page 62: “In February and March, 1941, the smaller searchlights were replaced by three 60 inch diameter, dispersed beam searchlights. At 800,000,000 candle-power apiece, these modern lights were one hundred times more powerful than their predecessors and they could penetrate the darkness for a distance of three to five miles.” And on the same page: “By December 1941 there were ten large, carbon-arc searchlights whose beams swept the entrance of Burrard Inlet. Classified as either fighting (concentrated beam) or observation (dispersed beam) defence electric lights---”. The two lights marked on the plan of the Battery on the web site are numbers 9 and 10. Given that number 10 is the most westerly light on the south shore of the harbour, one can assume that these two lights are among the 10 mentioned above. Given that they were part of the battery construction, my guess is that they were “fighting” lights as that term is used above. Also, the following appears at page 152 of the Maritime Defence of Canada by Roger Sarty: “Another early project was the installation of the 60 inch, 80 million candle-power searchlights that Canadian General Electric began to deliver to the east coast early in 1940 and to the west coast later in the year.” The preceding is not definitive. Life for the men at Fort Grey was pretty humdrum, with little excitement to break the monotony of their watch duties. Theirs was to be an existence of drills and exercises. This was probably a good thing, for despite it's apparent power, Fort Grey was like other coastal defences of its type, out of date by the Second World War. The rise of air power had seen to that. Vancouver was more likely to be attacked by carrier-borne aircraft before any naval assault. Air power could, and did put gun batteries out of action, an example being the Labrador Battery at Pasir Panjang in Singapore during the Japanese assault on the island in February 1942. Not only that, but the main armament was not exactly in first class condition. Gun No. 3 was faulty and orders had been issued that it was only to be fired in an emergency. One wonders what the good citizens of Vancouver would have thought of their defences had that fact been widely known. So, fortunately, Fort Grey never had to fire a shot in anger and it remained manned until September 1944 when it was reduced to care and maintenance.